Note: The PDFs are made from high-resolution (print-quality) scans of the original fanzine, and are accordingly somewhat large. Where possible, I've also included reduced-file-size versions, compatible with Acrobat 6 or 7 only, which are almost as good quality as the full-resolution files. Now that the project is complete, Taral has made the entire 16-issue archive of Energumen available on CD - see below. The cost of the CD includes a $1 donation to TAFF in Mike Glicksohn's name. Had enough of beaten-up copies of old fanzines? Start by throwing away your incomplete run of Energumen, and replacing with the recently published digital-age complete run of Energumen on CD-ROM. 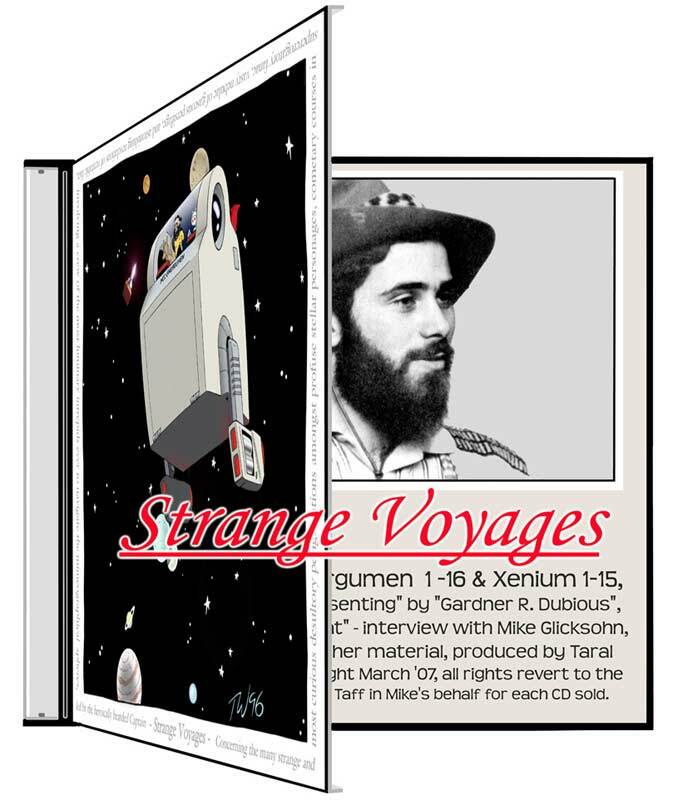 STRANGE VOYAGES is not only every issue of Mike Glicksohn's Energumen in printable form, but also every issue of his later personalzine, Xenium. Additionally included are The Hat Goes Home (Mike's Aussiecon GoH trip report), Mike's only published short story "Dissenting", an exclusive in-depth interview "Speaking Through His Hat", Bill Bower's introduction of Mike from the Aussiecon program book, as well as an introduction & preface to the CD-ROM. Over 1200 pages of reading! Other features include full colour images of Mike's famous paste-in inclusions (such as photos, swizzle sticks, ale labels, mastercard receipts, fold-out maps of the London Underground, and even patches of shed snake-skin). All you need to run the CD-ROM is a free down-load of Adobe Reader, if you don't already have a copy, and the software to open an MS Word Document. ...Also $15. 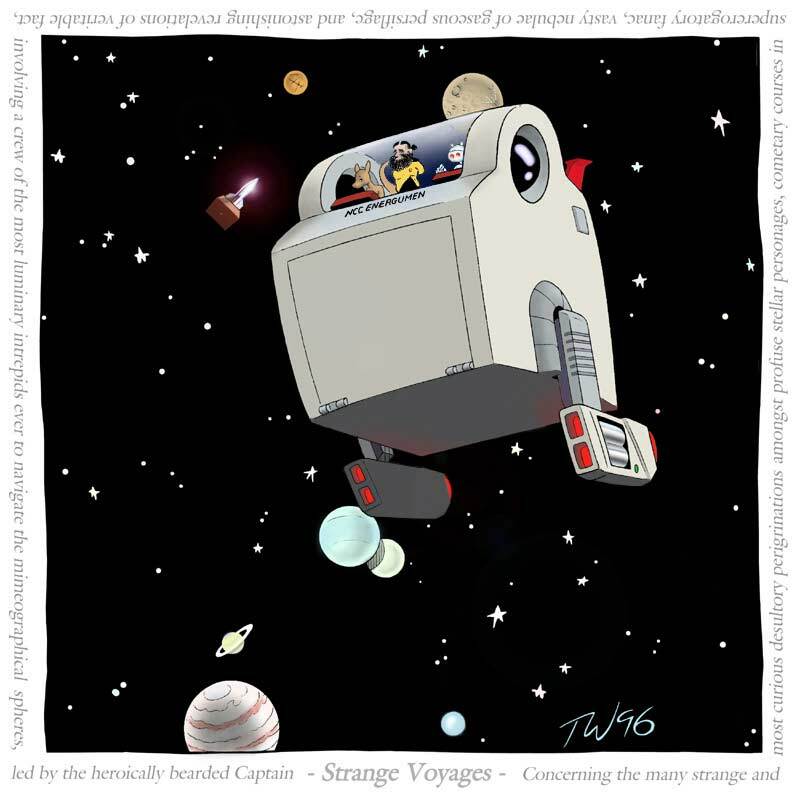 Strange Voyages is available from Taral Wayne, 245 Dunn Ave. Apt. 2111, Toronto Ontario, M6K 1S6 Canada. $15 (US or Canadian) covers shipping and handling as well as $1 to be donated to TAFF in Mike's name. For orders outside North America, please add $2 to cover the extra cost of postage, for a total of $17. Introductions that talk more about the knob writing them than about the subject are the bane of this business. Nevertheless, I’m going to start by talking about myself, so bear with me. I date my entry into fandom to November 1971, when I attended my first meeting of a science fiction club called OSFiC. The meeting was in the basement of a neighbourhood library. It was dark and hushed, as library basements generally are, despite the twenty or thirty people packed into the room and milling around. I didn’t know any of them, but by evening’s end would have made two life-long friends. Of course I didn’t know that just then. I also didn’t recognize the object being handed around from one person to another. It was a collection of goldenrod coloured paper, stapled together along one side, as a sort of magazine. I was sharp enough to work that out. What it was, though, and why some people were getting one while others weren’t was beyond my comprehension. Well, of course they were copies of Energumen. By then Mike & Sue had already published nine issues, and the copies I observed at that OSFiC meeting were likely either the ninth or a newly minted issue ten. It was my first, albeit distant, exposure to the world of fanzines. It might not have been the best fanzine of its time, but it was an exemplar of its type and no one would dispute that it was one of the best. It was in a class with Kratophany, Granfalloon, Maya, Outworlds, and Warhoon. 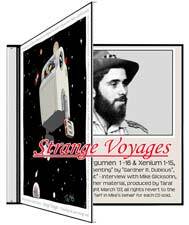 In 1973 Energumen won a Hugo at Torcon as best fanzine of the year. A few years later its co-editor Susan Wood won a Hugo for best fan writer. 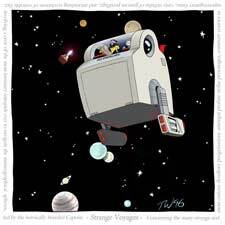 As well, many of its regularly contributing fan artists won Hugos for their work. Clearly Energumen was at the peak of its form and time, and no better showcase for the finest talents in fandom of the early 70’s can be found. From a more pragmatic viewpoint, I had an excellent scanner and happily all sixteen issues. And strangely, I’ve found that fanzines on line are very nearly all contemporary titles. It pleased me that by archiving Energumen I resurrected a tradition of excellence in Canadian fan activity that has largely faded with time. For a number of years, Canadian zines from Montreal to Vancouver flooded the mails, making artists, writers, loccers and pubbers, household names in America, Australia, and the United Kingdom. It was a golden age the like of which hadn’t existed since the days of the first Torcon, Canfan, and A Bas. Sometime in the late 1980’s it could be seen that the impetus had begun to fail. The second golden age was drawing to a close. Today it cannot be said that any remarkable instances of the fanzine form can be found in Canada. Perhaps bringing Energumen back to light will raise the bar once again and inspire a new golden age, though to be honest I believe the necessary conditions and ingredients are most probably missing. Science fiction no longer has the same relationship with society at large that it once did, and furthermore it’s prohibitively expensive for most fans to mail bulky printed matter around the world. A third golden age would almost certainly have to evolve on-line. So far there is little evidence of it. A few contemporary zines can be found on-line as Acrobat or Word documents, and only one or two published taking full advantage of the digital format. The temptation to simply “blog” is too strong I suppose. Desktop publishing software costs money, and has a steep learning curve to learn how to use. Still, by archiving Energumen the example will be there to inspire, and if no future golden age of digital fanzines comes of it, at least the pleasure of reading some of the best of fanac of a by-gone age has been made available again. Note: Susan Wood also edited Aspidistra (five issues) and after her untimely death Jerry Kaufman compiled an anthology of her writing. Both may be found on the Susan Wood page.